Last week I attended a conference on Zionism at Brandeis University. It was an excellent conference populated by highly capable people all of whom had something to say and are worth listening to. There were lectures on the history of Zionism and its various expressions. The essence of Zionism is a rather simple idea. It was a national movement designed for the care and feeding of Jews who had a history of displacement and discrimination. Zionism was about finding a home and reconstituting the Jewish people as a nation along with the promotion and development of Jewish culture, history, arts and literature. Zionism was a program designed to foster a transition from a dispersed and discriminated religious group to a coherent nation. The Israeli-Palestinian conflict can be understood as filtered through these lenses. The current intractable nature of the conflict is the result of the clash of “narratives.” And narratives are subjective and rooted in the beliefs of one group or collection of individuals. Because narratives are personal and assumed to be the “reality” of the individual or group they must be taken seriously. So a Palestinian can tell his or her story and it must be treated as truthful, real, and respectfully. The same is true for an Israeli Jew. His story must be treated as truthful, real, and respectfully. The two realities are incommensurate and share very little in common, they have almost no sense of overlapping historical evidence or truth, the two narratives are almost incapable of sharing facts or interpretations, but both must be considered “real!” The two sides cannot even narrate one another. The Israeli “war of independence” is a Palestinian “disaster.” This paradox goes directly to the heart of the conflict. The conflict is a consequence of contemporary sensibilities about truth and reality, and a form of political correctness, as much as it is about historical events. So Zionism, which was so central to the redefinition of Jewish nationhood, is now an opaque and harsh term according to many that has degraded in significance. In the future I think there needs to be more discussion of how this happened and why. Finally, the argument that Zionism has successfully established the state of Israel is a defensible one, but now there needs to be room for some sort of new Zionism: A Zionism that continues the tradition of developing Jewish nationhood but adapts to current political and geographic conditions. This sort of Zionism might include more attention to democracy, conflict resolution, and better ways to coexist in the neighborhood. Obama’s Anti-Democratic Assassinations: His Robot Killers Will Get You! If Bush and Cheney had commissioned the white paper and used its justifications there would’ve been an outcry about Darth Vader and his minion perpetrating evil throughout the land. But Obama can have a “kill list” and no one says much. Nevertheless, the document is about as anti-democratic as you can get. Here is the White paper on drones. It is used as a justification for targeted assassinations. I must say this issue taxes one’s ability to support broader political concepts, important as they may be, over a gut reaction. What I mean is that killing Al Qaeda operatives who are racist, sexist, anti-democratic, and potential threats to the United States doesn’t bother me much. But a couple of chief White House officials sitting in a room making the decision by themselves – essentially being judge, jury, and executioner – with no political or democratic oversight does bother me. The white paper focuses mainly on when lethal operations against a US citizen are justified. The paper makes for interesting reading because it seeks to clarify the issues but actually underscores their ambiguity and problems. Let’s take a look at a few of the issues of interest. 1. It is assumed that the President of the United States can respond to Al Qaeda on the basis of his constitutional responsibility to protect the country. The president can act quickly and on his own regard even in the case of an American citizen if that citizen is deemed to pose a threat or considered a member of an armed force challenging the safety of the United States. The legal question becomes whether or not a lethal operation against the US citizen is protected by the Fifth Amendment’s due process clause. The issue includes the matter of where the US citizen is located such as on a battlefield or in another country and if he or she is afforded any special constitutional protection. The paper concludes that killing a US citizen can be justified even if it is outside the United States. 2. The strongest defense of immediate violent action is the concept of “imminence.” Imminence is a well understood concept in the literature on politically protected speech. That is, one has many freedoms of speech available but cannot create a clear and present danger, cannot create danger that is imminent or about to happen immediately. The old tried-and-true example of yelling “fire” in a crowded theater is applicable here. I can advocate aggressive action against the collective group (e.g. the police) in the political theory or hypothetical sense but I can’t tell someone to go get a gun and kill the person next to them. I cannot create with my speech or my symbolic behavior imminent danger. This issue of imminence has been a conundrum for the government and the white paper solves the problem by redefining imminence because it is too difficult a standard to meet. It is just too difficult to show that an Al Qaeda operative whether he or she is a citizen or not is posing an immediate and imminent danger to the United States. Thus the white paper argues that the president or high-level official only needs to decide that the person of interest is a “continuing” threat to the US. This is a much easier standard to reach. In fact it is extremely vague and means that the target of interest does not have to be posing any genuine immediate threat, perhaps has never been charged with a crime, and may not even be in the United States or nearby. But they are a “continuing” threat if they are simply known to be an associate of Al Qaeda. 3. The absolute worst thing about the white paper is its claim that the government need not ask anyone’s permission, is required to make its case to no court, before carrying out a targeted assassination of US citizen. Again, a couple of governmental officials can make this decision on their own, can create a kill list, without acknowledging any additional authority. They can kill American citizens and don’t have to answer to anyone. This is dangerous business and clearly a direction contrary to the history and development of the United States. In one opinion (see http://www.aclu.org/blog/national-security/justice-departments-white-paper- targeted- killing) court cases are clearly cited that require the government to afford a citizen due process before depriving him or her of life or liberty. This due process seems to evaporate even when explaining that some sort of due process might reduce the errors and mistakes that result in taking innocent lives. The white paper argues that it is not subject to judicial review, and even argues that review “after the fact” is not legally required. Hence, one cannot question the government’s decision about targeting a citizen even after the fact. One can at least imagine the security problems associated with getting a priori permission but these did not describe the importance of at least after-the-fact judicial review. These justifications for targeted killing seem extravagant and potentially dangerous. Moreover, some sort of a priori judicial or congressional oversight is not difficult to establish. When grappling with the difficult issues of intractable conflicts and how to moderate them one always encounters the “contact” solution; in other words, the two competing groups must get together and begin the process of communicating in such a way that the differences dissipate. There is sound research supporting such a suggestion and my own work, along with many others, is deeply focused on the processes of difficult conversations – or, as some term, dialogue. There is always then a chorus of people who chuckle and say “this won’t work”. The depth and intensity of the conflict between the two parties, so the claim goes, is so great that talk is a waste of time. Well, this is true sometimes. I know of no serious scholar who believes that talk is magic, but I also know of no serious scholar who doesn’t recognize the centrality of interaction, contact, and some properly controlled form of dialogue. What do you do about situations we’ve been reading about recently? I’m talking about the reports of fan racism in soccer in Israel. Israel has suffered a few difficult instances in the last few years with respect to violence against Arabs and Palestinians. But the sports context seems to exacerbate the problem and provide a context for a poison cocktail of attitudes, energized competition, and ignorance that produces a combustible mixture of racism. Recently, plans by Beitar Jerusalem soccer club to add its first Muslim players prompted violent and racist incidents in Israel. During a recent match between Beitar and a team from Umm El Fahm hundreds of police had to be deployed. 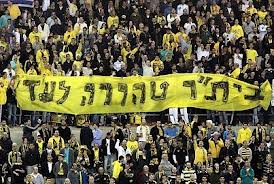 Beitar Jerusalem fans held up the banner above(which reads “Beitar will remain pure forever”) which connotes very unpleasant references to “group purity” an attitude that Jews – at least most Jews – would like to forget. Beitar gets its name from the youth movement, linked to Herut the forerunner of Likud, which opposes Israel’s Arab neighbors. The team name symbolizes a position of honor in Israeli youth movements. Some Beitar fans lead chants calling the Arabs offensive names, which prompts the Arab teams to call out “Allahu akbar.” Some Israeli teams do include Arabs but not Beitar. The sports environment activates group level perceptions that cause fans and players to identify even more strongly with their national and ethnic group. Sports is a team activity and it is thus easier to foreground a collective group identity. The “individual” versus “group” level of perception is exaggerated in the sports context. People can feel threatened or vulnerable and they can feel this on an individual basis or a group basis, and the two levels of perception can be quite distinct with some situations, such as during heated competition, causing greater distance between the two. For example, if a Jew were asked whether or not he feels vulnerable or threatened he might say “no.” He personally feels secure and not threatened. But if you ask that same person whether or not his group (Jews) is vulnerable or threatened he might say “yes” my group the Jews are vulnerable and threatened. Some studies show that the more one feels his or her group is vulnerable or threatened the more conservative they are with respect to social policies and security. It’s clear that Israel is expressing its insecurities and hardening its own political stances because it increasingly feels threatened and vulnerable at the group level. The sports context and public displays of demands for “purity” (meaning no Arabs) are troubling examples of the increased polarization in the Israeli-Palestinian conflict. Nothing is separated from politics in Israel because conflicts of such intractability permeate the entire society. The whole culture participates in the conflict ethos. Ultimately the goal is to play soccer without charging ethnic tensions. Talk will not solve the problem at the moment but it will one day.